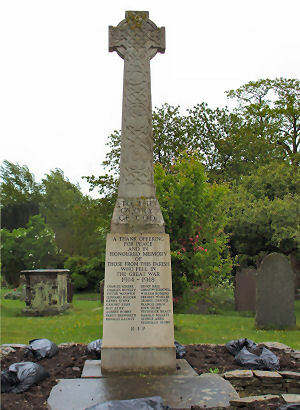 The Memorial is situated on the Southern side of the churchyard of the Parish Church of St Peter, Frampton Cotterell, Gloucestershire, UK. It consists of a tall plinth surmounted by a decorated cross all constructed in concrete. The data provided by George Hall and Alf Beard differs. EACOTT Ronald James L/Cpl 15059 9th Leicestershire Regt, died 1 October 1917 age 22. Son of James George and Georgina nee Foote Nephew of Emma Eleanor Roach, of East View, Bagstone, Wickwar, Glos. Commemorated on the Tyne Cot Memorial, Belgium and also on a family memorial in the churchyard St Peter’s the parish church. GIFFORD GeorgePte 33926, served in the 1st Bn. Wiltshire Regt. and died on Saturday 4 August 1917 aged 22 yrs. He has no known grave but is commemorated on the YPRES (MENIN GATE) MEMORIAL, Ieper, West-Vlaanderen, Belgium. He was the son of George and Eliza (nee Pullin) Gifford of Harris Barton, Frampton Cotterell. HOLDER Leonard George Pte 145 44, served in 7th Bn. Somerset Light Infantry and died on Tuesday 13 June aged 20 yrs. He is buried in VLAMERTINGHE MILITARY CEMETERY Ieper, West Vlaanderen, Belgium. Son of Edwin and Elizabeth, Frampton Common, Frampton. MILLETT Harold Pte 21340, served in 9th Bn. Army Cyclist Corps and died on Saturday 19 October 1918 aged 22 yrs. He is buried in HIGHLAND CEMETERY, LE CATEAU, Nord, France.XII.A.6. He was the son of Albert and Elizabeth Millett of 4, School Road, Frampton Cotterell. REVELEY Charles Pte 10317served in 2nd Bn. South Wales Borderers and died at Gallipoli on Monday 26 April 1915. He has no known grave but is commemorated on the HELLES MEMORIAL, Turkey. Grandson of Mary Ann Hollister and son of Alice [1901, widowed] all at Crossley Cottage, Winterbourne, Glos. RICHARDSON Ronald George Driver T/221470, served in the Royal Army Service Corps and died on Monday 28th August 1944 aged 32 yrs. He is buried in FRAMPTON COTTERELL CHURCHYARD. He was the husband of K M Richardson of Filton, Bristol. ROGERS Charles. Private, served in the 8th Bn. Gloucestershire Regt. and died on Thursday 30 May 1918. He has no known grave but is commemorated on the SOISSONS MEMORIAL, Aisne, France.Son of Charles and Annie Rogers of Frampton Common, Frampton Cotterell Born 1894 in Frampton Cotterell. STIFF Cecil Garnett Pte 460174, served in the 44th Bn. Canadian Infantry (New Brunswick Regt.) and died onSunday 6 May 1917 aged 31 yrs. He is buried in Frampton Cotterell churchyard. He was the son of William Edmund and Cecilia Rebecca (nee Sampson) of Frampton Cotterell and brother of Horace Roy who also fell. STRUGNELL Christopher GeorgePrivate 67885, 7th Bn. Royal Fusiliers. Died on Tuesday 30 October 1917. He has no known grave but is commemorated on the TYNE COT MEMORIAL. Zonnebeke, West-Vlaanderen, Belgium. Son of George Edward and Eleanor Gilmore nee Samuel . His occupation in 1901 was a Pupil Teacher in a National School.